DLA-X5900W has a brightness of 1800 lumens and native 40,000:1 contrast ratio producing vivid 4K HD images. Also available in black. JVC DLA-X5900W projector is equipped with an array of carefully chosen components including patented D-ILA and 4K e-Shift4 technologies that generate rich, vivid and smooth 4K HD images just as the producer’s intended. DLA-X5900W delivers brightness up to 1800 lumens with a great native contrast ratio of 160,000:1 for peak whites and abysmal blacks. It has an ultimate dynamic contrast ratio of 400,000:1 and native contrast ratio of 40,000:1 achieved via original D-ILA device and the 265W NSH high-output lamp with xenon lamp colour. Auto HDR maximises compatibility with 4K HDR content, alongside low latency for better gaming. A new filter has been adopted in the ‘Original Real Colour’ imaging mechanism capable of accommodating the DCI colour space for true-to-life stunning 4K pictures. Motion Enhance lessens the lingering images and distortion commonly found in fast-paced images by optimally governing the drive of D-ILA devices. Hybrid Log-Gamma, for impending HDR and streaming broadcasts, provides a huge augmentation of quality for more natural aesthetics. You are immersed further so you can enjoy TV programs unlike ever before. The DLA projector combines two technologies; a moving picture interlude ‘Clear Motion Drive’ which supports 4K60P data as well as ‘Motion Enhance’ which regulates the performance of the unit by image characteristics. This combination enables reduction of ghosting or afterimage issues usually found in rapid sequences to replicate a crisp and smooth scene. Image delay is suppressed for quicker response in PC and game consoles. 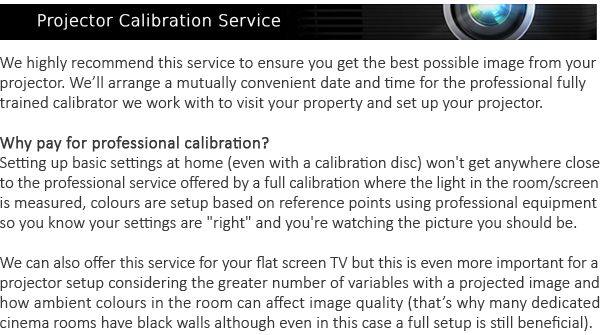 Auto-calibration uses a visual sensor to optimise vital components such as colour balance/space/tracking and gamma attributes. 12-point physical gamma tuning is included in the software. Achieve a genuine cinemascope with five memory zoom presets. At the touch of a button, transform 1.78:1 black border movies to a full size cinemascope when using a 2.35:1 projection screen. The projector has 136 screen adjustment modes, 10 lens memory functions as well as an automatic lens cover. The 6th generation 0.7" Full HD D-ILA (1920 x 1080) x3 device, which has an even narrower gap between pixels and is planarised, achieves brighter images rich with contrast. This projector has been designed optimally for ultra-high 4K without any screen-door effect. The projector facilitates 4K Projection with e-shift 5 Technology and Multiple Pixel Control processor along with a resolution of 1920 x 1080 (in 3D). This projector has function to allow the pixels to be adjusted so you can precisely correct colour deviation in 1/16 pixel increments, and you can segment the screen into 121 parts for individual adjustment. Two customized settings can be stored in the memory. To match the move toward high resolution, to deliver immersive high-definition 4K images, Multiple Pixel Control has been significantly improved upon by using new analysis software capable of more accurate diagonal-detection between frames for full high definition and 4K resolution signals. X5900W complies with the latest HDMI/HDCP 2.2 standard to enable full spec 4K signal input up to 4K60P 4:4:4. To view HDR is a simplistic process, the projector automatically switches to HDR picture mode when HDR10 signals are received. X5900 has dual HDMI (3D), RS-232C (D-sub 9pin), LAN (RJ-45), Trigger (Mini jack) and 3D Sync (Mini DIN) connectors. For 3D viewing wireless transmission options have been included, such as radio frequency transmission with PK-AG3 3D Glasses for 100H continuous operation and PK-EM2 3D Synchro Emitter.